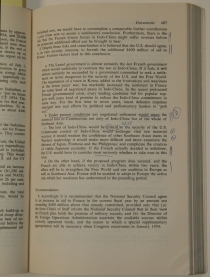 William Bundy’s 5-volume set of the “Senator Gravel Edition” of the Pentagon Papers, with annotations, marginal notes, and two legal-size pages with handwritten notes arranged chronologically. 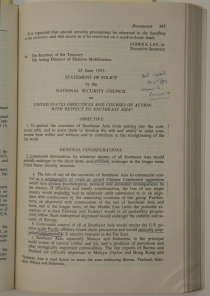 Defense Secretary Robert McNamara commissioned a massive study, later called the Pentagon Papers, in 1967 and appointed Pentagon arms control director Leslie Gelb as the project’s supervisor. 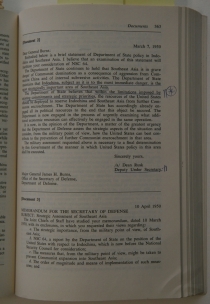 Gelb hired 36 military officers, civilian policy experts, and historians to write the study’s monographs. The Pentagon Papers included 4,000 pages of actual documents from the years 1945–67. 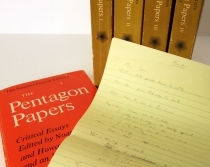 Daniel Ellsberg, with the aid of his friend Anthony Russo, leaked most of the Pentagon Papers to New York Times reporter Neil Sheehan, who began publishing excerpts on June 13, 1971. Ellsberg later said that the documents “demonstrated unconstitutional behavior by a succession of presidents, the violation of their oath and the violation of the oath of every one of their subordinates.” Portions of the “Papers” were subsequently published by Beacon Press. 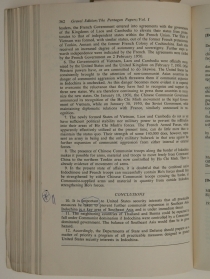 The present copy is William Bundy’s set of that edition. 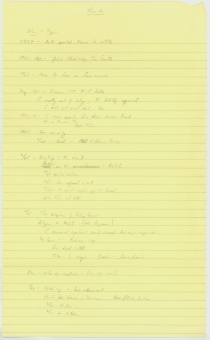 William Putnam Bundy (1917-2000) graduated from Yale University and worked as an analyst at the Central Intelligence Agency in the 1950s. He had a long, distinguished service government in the CIA and in the Defense Department. 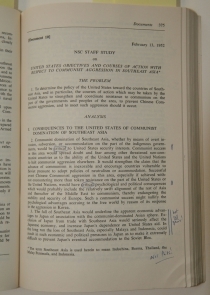 He was appointed Assistant Secretary of State for Far Eastern Affairs in March 1964. 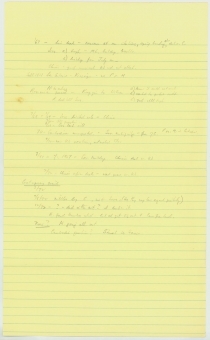 His brother McGeorge Bundy was Special Assistant for National Security Affairs to Kennedy and Johnson from 1961-1966. Both are considered primary architects of America’s involvement in Vietnam. 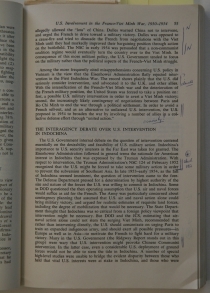 In The Best and the Brightest, David Halberstam stated that during the Kennedy and Johnson administrations, William Bundy’s name “would probably be on more pieces of paper dealing with Vietnam over a seven-year period than anyone else’s.” The publication of The Pentagon Papers represented something of a personal defeat for Bundy, who at the time had a 1,100-page unfinished manuscript in which he selectively paraphrased from classified papers in his possession. The manuscript was rendered unpublishable by the appearance of these volumes. McGeorge Bundy (1919-1996), brother of William Bundy, was one of President Kennedy’s closest advisors on national security, and he continued to fill that role for President Johnson during the period of escalation of the Vietnam War. He left government service in 1966 to head the Ford Foundation, and then returned to university teaching and writing in 1979. Very Good. Some wear to covers.